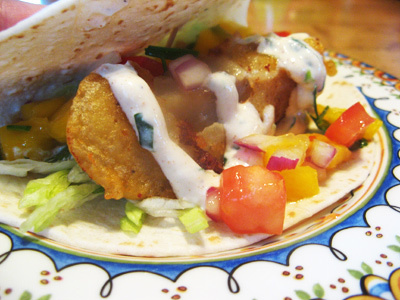 These fish tacos are filled with a beer battered fish and topped with a mango salsa and baja sauce. Cameron loves these tacos and frequently asks for them. 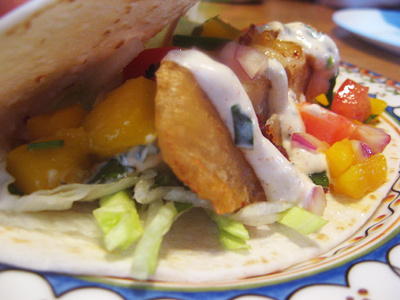 The fish recipe is borrowed from Cooking Light and seemed perfect for a fish taco. I tend to pick up whatever fish looks good and at a reasonable price. 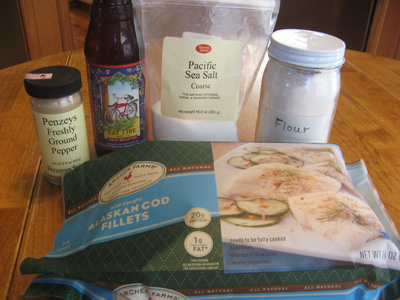 This time it was cod, but I have used tilapia and swai fillets and they worked well in the beer batter as well. I like to make up the baja sauce ahead of time so that all the flavors have time to distribute. 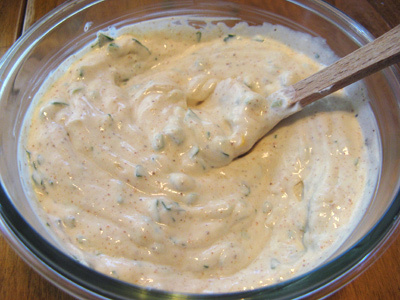 For the sauce I used some sour cream, greek yogurt, mayo, salt, southwest seasoning, jalapeno, lime and cilantro. 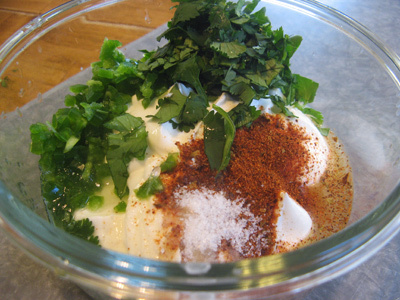 Mix together 1/2 cup greek yogurt, 1/4 cup sour cream, 1/4 cup mayo, 1 teaspoon southwest seasoning, 1 diced jalapeno, juice of 1/2 lime, 1/4 cup cilantro, 1/4 teaspoon salt. Stir it all together, cover and place in the fridge. 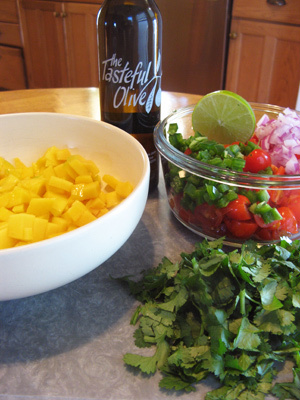 The mango salsa includes a ripe mango, 1 cup of tomatoes chopped (I had some grape tomatoes on hand), 1/4 cup diced red onion, 1/4 cup roughly chopped cilantro, 1 diced jalapeno, spritz of lime juice. Everything’s chopped and ready to combine. I added a drizzle of Mango Balsamic to taste. It’s tasty if you have some on hand, but not necessary. 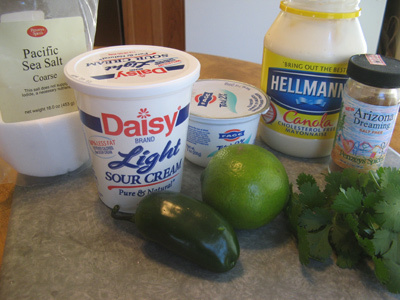 Back into the fridge until time to assemble the tacos. For the fish and batter you’ll need 1 pound of fish, flour, dark beer, salt and pepper. I cut the cod into taco friendly pieces then sprinkled with salt and poured 1/4 cup of beer over top. Let that set for 30 minutes in the fridge. 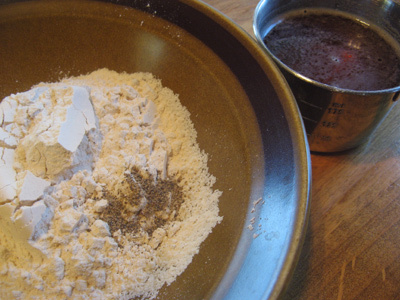 Combine 3/4 cup flour and 1/2 teaspoon pepper. 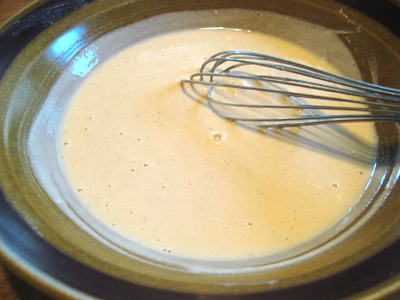 Whisk in 3/4 cup beer until you have a smooth batter. Drain you fish and pat dry with a paper towel. Dip the fish into the batter and place in a non-stick skillet with enough canola oil to cover the bottom of the pan. I usually do 3 – 4 fish pieces at a time. Heat the oil to medium high and fry fish about 3 minutes on each side. Drain on a paper towel. 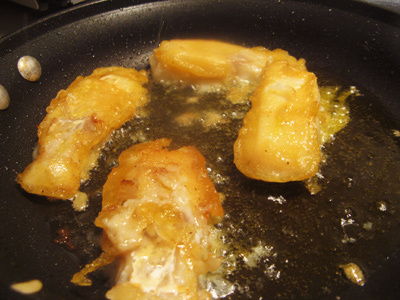 Replace any canola oil to coat the bottom of the skillet and fry remaining fish pieces. 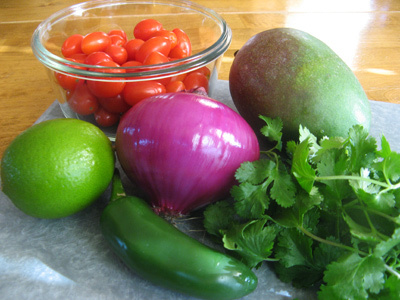 Assemble your taco by placing a little shredded lettuce or slaw on the bottom of a tortilla. Add 1 – 2 pieces of battered fish. Top with baja sauce and mango salsa. Cut fish into pieces that will fit your tortilla. 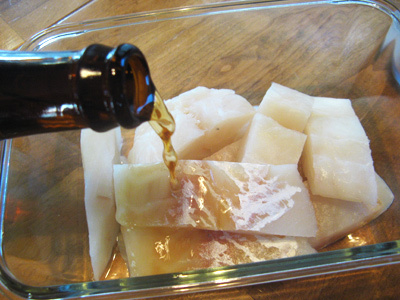 Combine fish and 1/4 cup of dark beer in a medium container. Sprinkle with salt. Cover and chill for 30 minutes to 1 hour. Drain fish, discard liquid, pat dry with a paper towel. Combine 3/4 cup flour, 1/2 teaspoon black pepper. Mix together and whisk in 3/4 cup beer until batter forms. Add fish pieces to batter mixture coating all sides. Heat enough canola oil to cover the bottom of a non stick skillet over medium high heat. 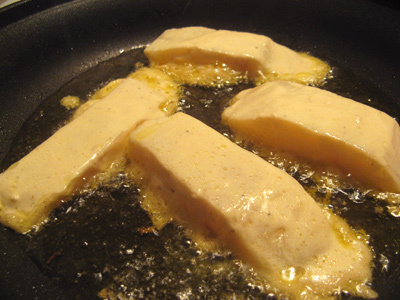 Remove fish from batter and place in skillet, cooking approximately 3 minutes on each side or until done. Cook a few pieces at a time adding more oil to the skillet when needed. Transfer cooked fish to a plate lined with a paper towel. To assemble tacos, place a little shredded lettuce or coleslaw onto a small flour tortilla. Add 1 – 2 pieces of beer battered fish. Top with baja sauce and mango salsa. Combine all ingredients. Refrigerate until needed. These look fantastic! I’m loving the way that Baja Sauce sounds! 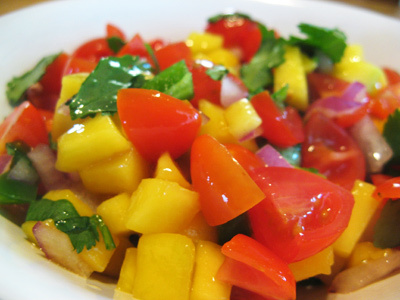 I made a modified version of these (minus the Mango Salsa) tonight and we LOVED them! I haven’t checked the pictures on my camera yet but if they come out good I hope to post about them in a couple of days. In case the pictures are lousy I wanted to let you know how much we enjoyed them. The Beer Batter was fantastic and the Baja Sauce (I don’t have the Arizona Seasoning so made up my own version) was terrific! Excellent meal tonight! Thanks for sharing! I’m so glad you enjoyed them! I look forward to your pictures.